Kazulias Nyheter: Dispatches from the Front. Prime Minister Amund Dahlberg ordered the expulsion of all Dankukin diplomatic personnel as it is the belief of the Department of Domestic Affairs that said diplomatic officials are believed to be involved in espionage and inciting violence against the Kingdom. Dahlberg, speaking before the parliament, said that the response would bring to a halt the conceptualisation of any diplomatic talks between the two nations on the ground of negotiating and mediating the diplomatic tension. Prime Minister Dahlberg recalls the exposing of a Dankukin espionage ring within the nation, citing that posterior to its dismantling Dankukin diplomatic officials operated as agents of espionage and destruction (as described by the Espionage Convictions Act). Director of the Security Bureau, Trond Nicolaysen stated that the agency had concluded its investigation into Dankuk's clandestine activities in Kazulia and discoveries made within the investigation lead to the expulsion of all Dankukin diplomatic staff existing within the nation, regardless of their operational capacity. Prime Minister Dahlberg stated that Dankuk's unresponsiveness to the situation accentuates on the fact of Dankuk's disdained attitude towards the situation. This coupled with the nations constant threats towards the Kingdom are among various vectors responsible for the Prime Minister's recent move. The Office of the Prime Minister and other respective government departments refused to disclose further information on the Dankukin diplomatic personnel beyond the fact that they had involvement in espionage and other destructive activities against the state. The Department of Domestic Affairs labelled Dankuk's actions in Kazulia as "attempting to damage the very fibre by which the nation operates". Minister of Domestic Affairs, Melker Lundquist stated that a report on Dankuk's clandestine activities is to be released to the general public soon, where it intends on illustrating to the general public the extent of Dankuk's activities against Kazulia and highlighting on the possible outcome if said actions had not been foiled by the Security Bureau and the aforementioned expulsion. It has been reported that the Security Bureau has opened a counter-terrorism investigation into the presence of "agents of crisis and confusion" in the nation. The Federal Police's Special Services Branch (the nation's foremost unit responsible for counter-terrorism, counter-espionage and domestic surveillance), is reported to having a hand in the investigation, however, the Federal Police has denied the unit's involvement. The expulsion of all Dankukin diplomatic personnel from the nation could also spell the same for nations that are supposedly supporting Dankuk. The Republic of Istalia, who had involved itself in training exercises against the Kingdom could soon see its own diplomatic officials being expelled from the nation on similar charges of working with external/internal bodies against the state. Government expels diplomatic staff amid increased threats; reservists called up to Dankukin Border . A Leopard 2D6KZ of the 5th Panserbrigaden in Arenheim as the 11th Home Guard Armoured Brigade makes preparations for an inevitable conflict. In response to increased threats from the government of Dankuk due to Skalm's unwillingness to bow to the demands of the government for the systematic destruction of modern Kazulian society, the government recently signed into action the Emergency Actions Plan, which outlined a series of steps and guidelines to be taken by the government in ensuring the nation's defence at these crucial and uncertain times. Against a background of increased tensions between the governments in Skalm and Taeyangsudo, Statsminister Amund Dahlberg convened with senior members of the cabinet to discuss the crisis amid provocations from the Dankukin Central Government. Sveinmar Sigurbjoernsson, Director of Communications in the Office of the Statsminister said: A demand threatening the integrity and security of the state will never be considered as a rational thought by the government. A demand reinforced by threats of conflict will never be considered by the government. As such, diplomatic staff from Dankuk have been expelled in response to their continuous threats. General Marius Aukland, Chief of Defence told members of the media that the government had authorised several strategic incentive with the passage of the Emergency Actions Plan. According to Aukland, a curfew had be imposed throughout the nation between the hours of 9:00 pm and 4:00 am. Under advisement from the Federal Police and the Border Security Agency, Individuals caught outside within the hours of the curfew, without a warrant of passage, shall be charged for disobeying the established curfew. Furthermore, the government authorised the Personnel and Recruitment Office of the Ministry of Defence to initiate the call up of reserves 100,000 in the Home Guard and the Land Forces. The Department for Civil Defence and Emergency Management announced its intentions to open civil defence infrastructures which were previously closed from public entry, this includes civil defence structures within government buildings. The department states that it wants to ensure that all citizens, regardless of their location or position throughout Skalm and other cities, are able to reach to a civil defence structure where ever it is available. 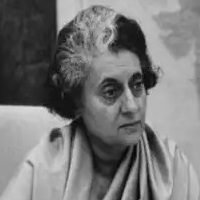 In accordance with internal laws, the government (since the initial introduction of the law) have taken a hard-line approach towards the construction of civil defence infrastructure with the government policy being that no new infrastructure (might it be civilian or government) may be constructed unless they feature provisions for civil defence. Apart from this, the Border Security Agency, the Federal Police and the Home Guard are expected to increase patrols of the border region in order to ensure that incursions are derailed/avoided. With tensions increasing it is not sure as to whom will launch the first blow, what is known is that both nations are close to the spark point. “The Consulat has been relaying information to Kazulia for years”. Dankuk has stated it will not accept any diplomats from Kazulia since they have dispelled all diplomats of Klavia. Dankuk has stated that it will go to war if necessary against Kazulia and if pushed to it use nuclear weapons. However Dankuk continued to wish for peace. It has stated that it wants to maintain peace wherever possible. Government launches operations to evacuate foreign nationals. In response to calls from the international community for Kazulia to allow for nations to evacuate their nations from Kazulia amid the coming conflict, the government announced that Northern Airline Systems, the nation's largest airline halted all commercial flights to international destinations in-order to accommodate for the evacuation of foreign nationals residing in Kazulia. According to the Immigration Bureau, there exists around 8 million foreign nationals residing in Kazulia, all of whom have dual nationality. Prime Minister Amund Dahlberg stated that the Kazulian Government was committed to the safety of foreign nationals residing in the nation, citing the nation's commitment to protecting foreign nationals residing within Kazulia. The Department for Civil Defence and National Preparedness issued a notice to foreign nationals requesting that they make contact with their nation's embassy or consulate general for arrangement to be made for their evacuation from the nation. According CEO of NAS, Bengt Axelsson, the airline intends on making trips to nations such as Hawu Mumenhes, Lourenne, Trigunia, Indrala, Vanuku, Selucia, Istalia, Dorvik, Hutori, Valruzia and a host of other nations in-order to evacuate all foreign nationals from Kazulia entirely at the request of the international community. Early this morning the empress requested martial law be imposed in Dankuk and later that day the entire cabinet approved. These cowards Kazulia have forced our hand. They will soon pay for there ignorance.They will soon see we are no pushovers. We will fight to the last man. They will taste the blood of there men upon there borders They will feel the heat of every atom bomb. The burning of sarin gas. And the deathly pain of our bullets. They will have no mercy. 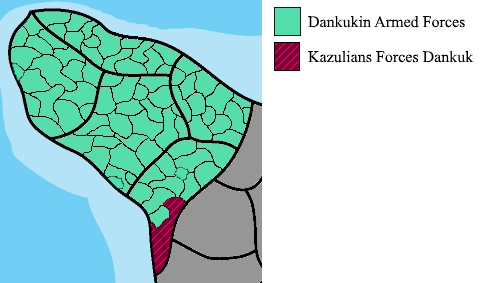 I think it’s time to teach Kazulia who controls Dankuk. Paratroopers positioned outside in South-Western Eljang prior to advancing to provincial administrative centre. An invasion force of around 180,000 troops and paratroopers was launched by the Kingdom of Kazulia in what Defence Command coined Operation Peninsula Spear. The invasion comes amid the assassination of Birger Dokken, the Consul General to Dankuk, as the Kazulian government and the nation in general has called for a vendetta. Prime Minister Amund Dahlberg stood with King Haakon around midnight when he declared that the armed forces would be launching an invasion of Dankuk. Prime Minister Dahlberg proclaimed that the government had acted on the willingness of the nation to seek vengeance and properly ensure the defence of the nation by ensuring the source of the threat had been eliminated entirely. According to intelligence sources within Defence Command, upon discovering that the Consul General had been killed at the hands of the Dankukin Government, General Marius Aukland, Chief of Defence of the Kazulian Armed Forces ordered the troops positioned on the border to cross over into Dankuk. On the naval front, the Kazulian Navy launched their surprise offensive. In the early hours of the morning, strike aircraft from the KNS-Queen Annette had been launched with the intention of sinking surface ships of the Dankukin Navy. This act, however, was called off as Admiral Audun Prestegard ordered the navy's submarines and surface fleet to handle Dankuk's submarine and surface fleet, enabling the strike aircraft to focus their attention on destroying Dankuk's ageing naval strike missiles positioned along the nation's coast. Reports from the battlefield say that causalities on the side of the Kazulian Navy comes to 3 frigates and 2 submarines destroyed at the hands of Dankuk's ageing-Trigunian made anti-ship missiles. Clashes on the maritime front are still on-going. According to reports from Defence Command the armed forces launched a simultaneous assault front three positions. An amphibious invasion launched by the 1st on the western coastline of the province of Eljang. Whilst the amphibious invasion was launched, an airborne assault had been launched by the five airborne brigades. Through its Artillerisystem 48 (M109 howitzer) and Artillerisystem 56 (ARCHER Artillery System), Kazulian artillery battalions, using counter-battery radar systems had sought to strike at Dankuk's anti-aircraft systems scattered throughout the country. Clashes in the cities of Soleunggo and Gongmangdo are currently on-going with many defence analysts confirming that these clashes will end in an unconditional defeat to the Dankukin Armed Forces in the two cities, as the air-force apart from evading and destroying Dankukin SAM sites, has been conducting a series of sorties throughout the nation on a close-air support basis. It is expected that these assaults are to be reinforced by reservists to maintain the momentum of the invasion. General Aukland stated that with the use of Auftragstaktik stated that the invasion will follow the principles of the doctrine, including a great emphasis on speed. Similar to Operation Soul Rebel from the War for the Emperor's Protection, Operation Silent Eagle is aimed at securing the northern country side of Mikuni-Hulstria. According to Defence Command, the Army was currently pushing around 10 divisions into the nation and according to reports, clashes are still ongoing. It was stated by officials from Defence Command that once the Army secured the northern country side, reinforcements will be sent as the army reserves prepare for possible mobilisation. The current efforts of the Army will be reinforced by the Royal Air Force who are expected to conduct a series of combined arms roles, most important ensuring that air superiority achieved and kept and conducting close-air-support missions. The invasion force was not short of resistance as already, the Personnel Office has accounted for nearly 1,000 kazulian deaths and around 2,000 injuries in the initial hours of the operation. An updated map of the battlefield. Last edited by Maxington on Thu Mar 29, 2018 7:36 pm, edited 1 time in total.